Google is involved in a lot more than directing you to websites. Click for a larger image and scroll down for notes. Search is the feature that made Google famous, and the company now handles approximately 3.5 billion searches per day using a complex algorithm to deliver accurate results. To do this, Google “crawls” the Internet’s 60 trillion pages, and organizes it into the company’s 100 million gigabyte index of the Internet. Google has also indexed more than 20 million books for its searchable database, Google Books. 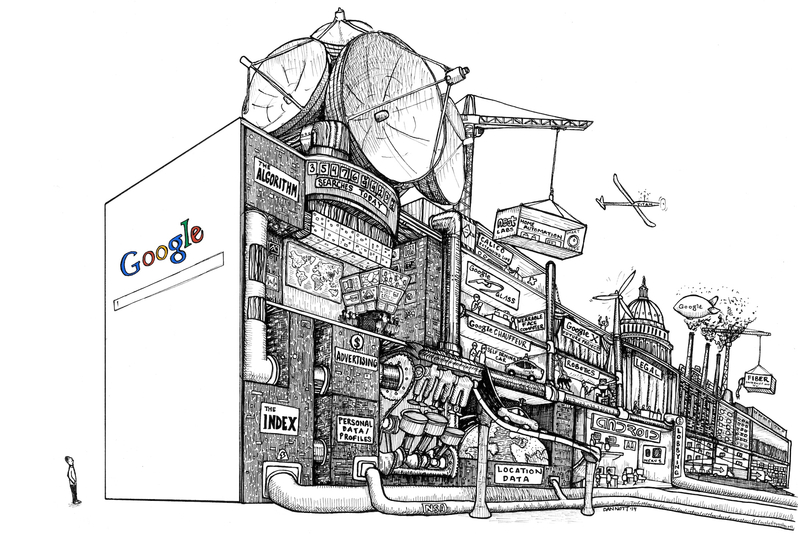 Advertising is where the bulk of Google’s money comes from, pulling in over $40 billion in revenue for the company each year. Google uses the information it learns about individuals from search and from mobile app data to deliver targeted ads. Google has created a digital map of the Earth, viewable in Google Maps and Google Earth. Using satellite imagery and on-the-ground data acquired by a fleet of cars fitted with panoramic cameras, Google has been amassing huge amounts of geo-data, including information like driving conditions, street signs and speed limits. That the cars were also able to capture Wi-Fi network information is the subject of an ongoing lawsuit against the company. Google also stores the personal location data it collects from mobile devices. While all tech companies deny giving NSA direct access to their servers, nine of the largest tech companies, including Google, are legally required to turn over personal data to the government when ordered through a program called PRISM. The NSA has also been able to secretly access this data through back doors, using a program called MUSCULAR. As part of Google’s semi-secret Google[x] lab, the company has been developing a self-driving car and the software to run it, called Google Chauffeur. The self-driving car, which still requires a human chaperone, has already logged more than half a million miles on the road without causing an accident, which is important given how bad at driving humans are. While it is unclear whether the technology will lead to fully automated cars or hybrid, computer-assisted cars, the advances in this field have the potential to change the way humans interact with automobiles. Google acquired 8 robotics companies in January and February, including Boston Dynamics, a prominent robotics company with ties to the defense industry. While many of the acquired companies are hardware producers, some, like DeepMind Technologies, specialize in artificial intelligence and machine learning. So far, Google has been quiet about what they will be used for. Another Google[x] project, Google Glass is essentially an internet-connected wearable face computer. Equipped with a camera, its so-far limited roll-out has been contentious. In addition to the self-driving car, Google Glass and robotics, Google[x] is involved in a variety of other “moon-shot” projects that outsiders can only speculate about. One such project, a literal “space elevator,” is on hold while technology improves. Same goes for the hoverboard. In January, Google paid a startling $3.2 billion for Nest, a company that manufactures high-end internet connected thermostats and smoke alarms. While the device is certainly cool, it is the home energy usage data that Nest generates which is particularly valuable to energy companies and makes the company a strategic investment. Google developed and maintains its own mobile operating system called Android, now the most common mobile operating system in the world. They also produce their own smart phones and tablets called Nexus. In 2012, Google bought Motorola Mobility for $12.5 billion, primarily for the original cell phone company’s extensive patent portfolio. Google sold most of the company to Lenovo earlier this year, but is keeping it’s “Advanced Technology and Projects (ATAP) group, headed by former DARPA director Regina Dugan. The team is currently working on a modular phone concept that has the potential to seriously alter the structure of the smartphone market. Like Apple and Samsung, Google is perpetually involved in high stakes legal disputes over patents and copyright infringement, as well as anti-trust concerns. They have also become one of the top spenders in Washington, coming in at #2 in lobbying expenditures in 2012. Google’s data centers require a lot of electricity, and Google has been making investments in wind farms and solar energy to power its operations. Google Energy has a US government license to buy and sell energy, allowing it to potentially act as a utility company. In 2013, Google purchased Makani, a company that aims to make tethered airborne wind turbines that can reach heights (and wind speeds) impractical for heavy, ground-based turbines. Google Fiber is a high-speed internet and TV project, currently operational in Kansas City and Provo, Utah. The project seems to be more about shaming big TV and Internet providers like Verizon, Comcast and AT&T into providing better service than actually competing with them. Google Fiber is looking to set up similar infrastructure in 34 more cities. Check out this cartoon and more at The Gabbler! To think…I’m in there somewhere!